If you love stationery like I do then you probably see cute cards everywhere you go. Maybe you even have a big “stash” of them that you just aren’t sure what to do with and can’t think of who to send it to. Well, I’m here to help! Here are 5 ideas of what to do with a card beside sending it! Greeting Cards are ultimately small pieces of art. What better thing to do with art than frame it. You can hang them on the wall in a small group. They can sit in their equally adorable frames on side tables or in your office\cubicle to dress it up! The winter holidays are around the corner, which means Holiday Parties Galore!!! I’m going to make you look like the most thoughtful guest ever. Write a sweet little note thanking your host or hostess for opening their home or office for a party and attach to a small gift. Possible gift options: a potted plant, flowers, the host\hostesses favorite wine, whiskey, tea or coffee, a box of sweets. 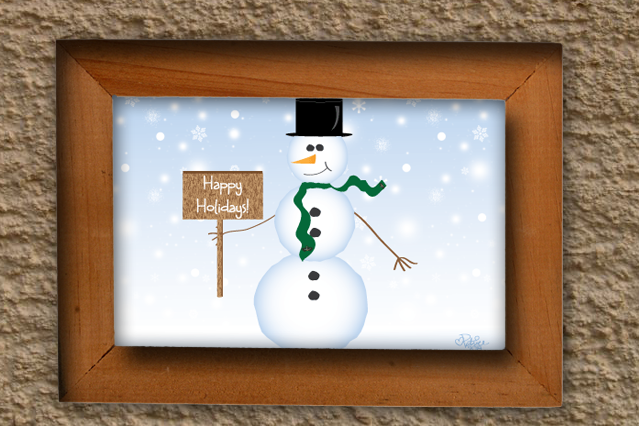 Buy several cards that you know the recipient would like. Tie them together with a ribbon or put them in a small box decorated box. If you have children, this is a great small gift from them or from the whole family. Each person can decorate a side of the box and you can put the cards in it. It’s a useful gift that will be treasured because it’s from you! This idea comes from the office manager of a previous job I held. When the office would receive a card for any reason the office manager would hang them on the mantle of the decorative non-working fireplace in the center of the lobby. At holiday time, the cards the office received were taped to loops of ribbon and hung on the staff tree. It’s a fun way to decorate your home or office all year long! Here’s another fun one if you have children or work with children. Take a magnet or recycle one you have and glue a card to the front. An alternate variation of the same idea is to glue a wooden clip or clothespin to the back of the card. You can use it to hang artwork or important memos on the fridge or where you will see them! The next time you see an adorable greeting card, but aren’t sure who the recipient should be, buy it anyway and give one of these ideas a try! If you want to share your ideas of what to do with a greeting card or you try one of these ideas please share them with me! I’m on Facebook, Twitter, Instagram or just email me a picture!